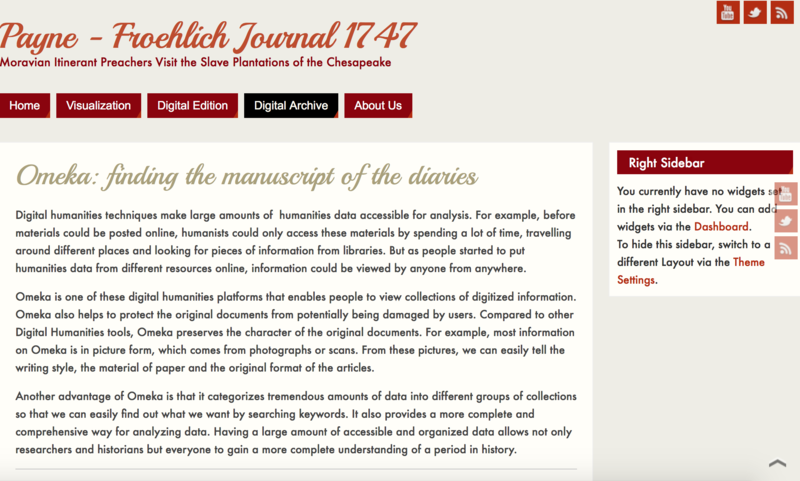 moravian journals – The Humanities Now! 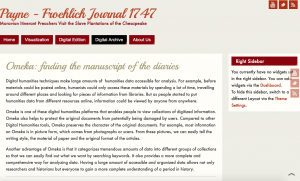 Since the beginning of HUMN 100 class, we have used a bunch of digital humanity tools to study the diary of the journey of Payne and Froehlich. We have done the work that starts from distant reading and ends to close reading. 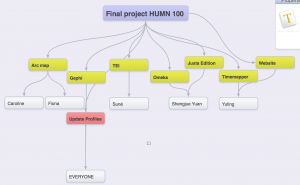 The work we have done on this diary is like a tree that Omeka and Juxta Edition are the most basic things of the work just like tree trunk and Oxygen, Timeglider, Time Mapper, GIS and Gephi are all very detail and all presents different aspects of the diary, just like branches. Since we have done a lot of work on this diary, we decided, at the end of the class, to make a website presenting the work we have done through the whole semester to people outside our class, including humanists and people who are not in this area. Therefore, we decided to go over most of the work we have done in this class and divide it into different work to everyone in our class. My job in this final project was to put original archive on Omeka and do the proofread of the transcription we did in early time of this semester on Juxta Edition. The job I got was crucial to the job we have done since they were quite fundamental in all the work we have done. 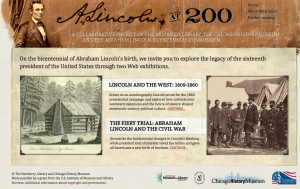 The first step is to put original archive on Omeka. I have two choices: either to put all the images of the archives into one item or to put each pages into different items. At first I tried the first one, thinking it would be more convenient for viewers to find out all the pages of the diaries if I put them together. However, there were some problems if I chose this. The first thing is that, once I put them all in one item and I submit them, they just appear in random order, for example, the first page follows the third page and the last page follows the second one. Therefore I decided to change the name of the images so that viewers will know which page they are reading. However, I found it would take a lot of time to find out the right page and it is inconvenient since every pages look similar and it is easy to mess up. 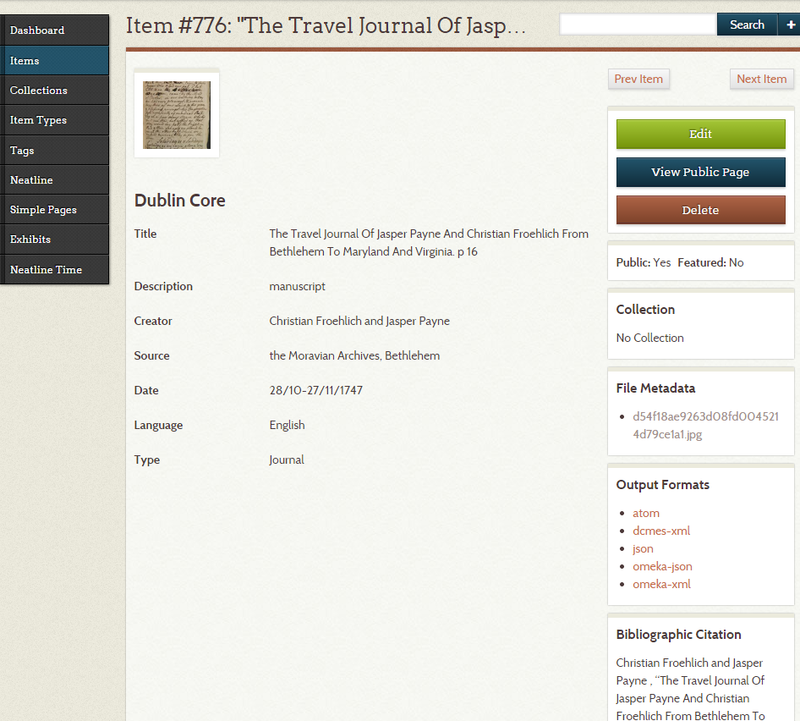 Therefore, I decided to put image of page on Omeka separately which means I put one page into one item. I searched out the item with all the pages we transcribed from Omeka and added something on it based on my previous experience on Omeka. I added description, which is manuscript, language, which is English and type, which is journal. The information gives viewer a deeper understanding of the work the first time they see it. The second step is doing proofread of the transcription we have done on Juxta Edition. The rule of the thumb of this work is to make sure the transcription work is as similar as possible to the original archive. However, such goal is hard to reach, since once we transcribe, we lose something, for example, calligraphy, the material of paper, the fringe of the text and different shades of color of the text. I used as much as I could use on the Juxta Edition to make sure not only we had the same spelling of the word in the transcription work with the original archive but also similar format of the text with the original one. I fond some mistakes we transcribed in spelling word: some are misreading and some are just typo. Also, we made some problem in format, and the most common one is that some of us choose to ignore the writing deleted by the author in the original transcription. So I added them on the transcription. I could not recognize some of the words Payne deleted and I counted how many letter Payne deleted and replaced them with “x”. I also use the “delete” format in Juxta Edition for these “x”s. The work we have done this semester gives us basic understanding of digital humanity study. At the beginning of this semester, I was very confused about the work we would do. 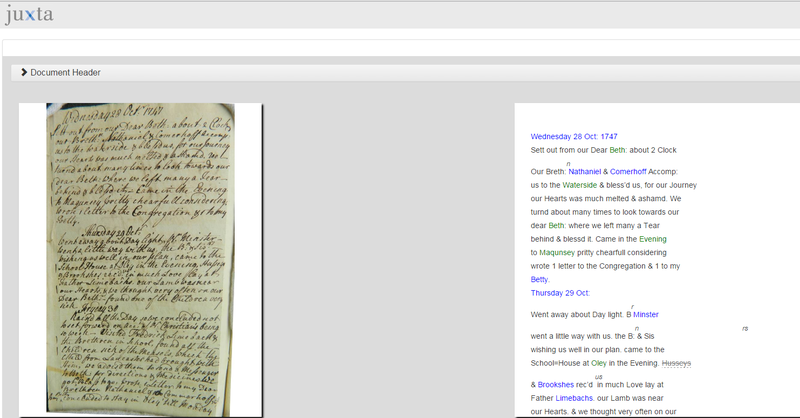 However, as we did more and more work on Payne and Froehlich’s diary, their journey became clearer and clearer to us. 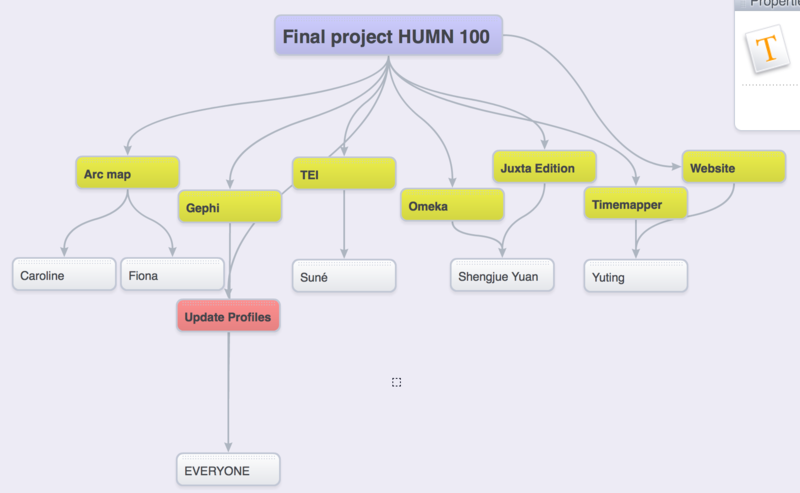 The work was becoming more and more detailed as we using different digital humanities tools. 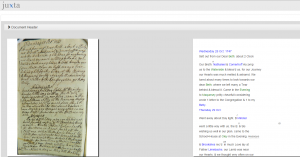 We started from transcribing the original document, which enabled us to read. Then, the work of XML helped us to extract the names, places and time and other traits from the text. We put them on time glider to extract the important events connected to places, people and time. Then, we explored more detail of this study—Gephi: explore the relationship between people. At last, we used GIS to make story maps. This work is quite different from the work we have done before, in which we just focused on the diary itself. However, GIS helped us to extend our study— we not only has the route of Payne and Froehlich’s journey, but also different map layers, which brought different events or aspects that happened in the same period together. By putting different layers together, we can learn about something that we can not know by simply reading the diary, for example, how did Payne and Froehlich picked up their route. The final project not only gave us a chance to present our work that we have done in the whole semester, but also enabled us to review what we have learned before. I always believe that subjects are always connected with each other, and they are not as separated as we think. This project helped me to identify this idea: in my geography class, our professor introduced it but we did not have a chance to use it. However, in this class, we learned how to use it, which helped me to gain a deeper understanding of GIS. Also, the digital humanities tools we learned in this class improved my understanding in geography class and art history class.